We provide a 24hr emergency boarding up service to secure the property and cover Dublin and surrounding counties. All types of boarding undertaken – from small windows to entire buildings. Generally, 10 -12 mm plywood boards are used but marine ply up to 19mm can be requested. Temporary doors for domestic and commercial properties can be fitted on site. Sub frames are built were necessary to protect existing window and door frames. 100mm & 200mm micron safety film is used to contain broken glass safely whilst new window panes are being manufactured. Double glazed units can be made safe using different methods dependent upon whether one or both panes have been damaged and the extent of the damage. (See double glazing section). All work is carried out to the highest industry standards. When it comes to an emergency with your double glazing, it is difficult to know what to do or who to call. Crystal Glazing are experts at dealing with emergency glazing situations so that our customers don’t have to worry. 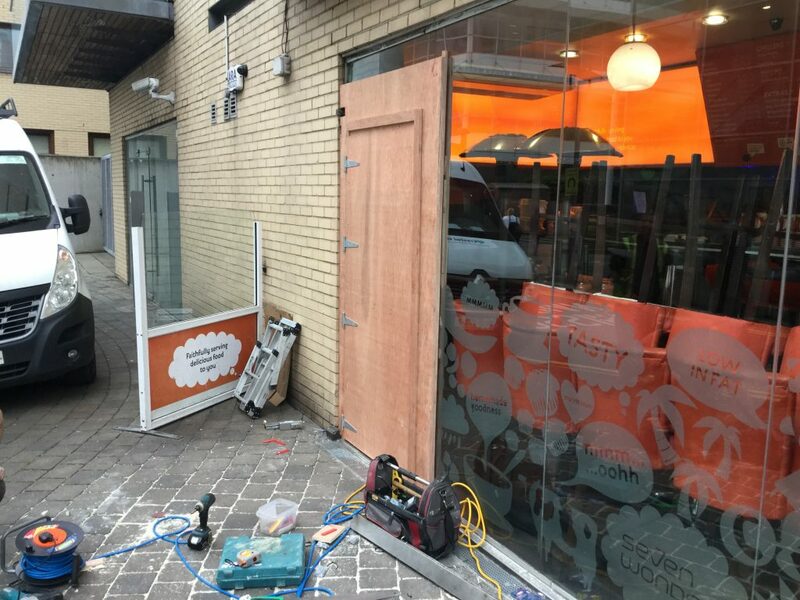 They will undertake emergency boarding up regardless of the size of the task and will complete all work as fast as possible to ensure your safety and security. For emergency boarding up you need a company that you can trust. Crystal Glazing have the experience and the know how to deal with any situation so that you don’t have to.